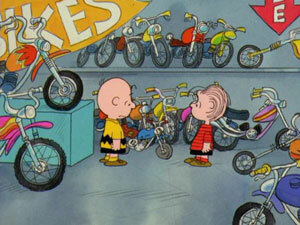 Charlie Brown enters the world of motocross, going up against friends and dog alike. And even if he can win, will it all have been worth it? This is Special #14, sandwiched between Be My Valentine, Charlie Brown and It’s Arbor Day, Charlie Brown. Four of the earlier specials have yet to appear on DVD, but we’re getting there. With so many of the holiday specials now out, Warner Home Video is able to devote some DVD releases to other favorites. 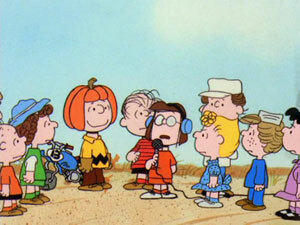 You’re A Good Sport, Charlie Brown, directed by Phil Roman, holds a special place in many fans’ hearts due to memorably featuring Snoopy in his guise as The Masked Marvel, with an ironic ending that is typical of the writing of Charles Schulz. 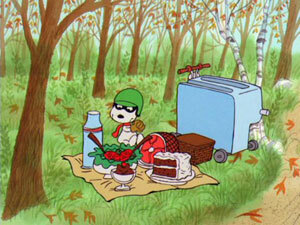 Schulz had featured motocross in some of his Peanuts strips, but the general storyline in this special was mostly new. 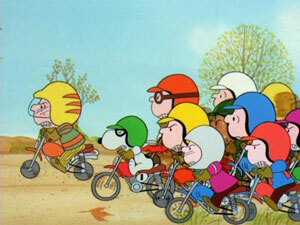 His son Craig was into motocross at the time, and in the strips Schulz had managed to capture much of what Craig had enjoyed about the sport, such as all the danger and dirt involved. Though Sparky might not have shared all of his son’s enthusiasm for motocross, he did usually find something to appreciate about all sports— particularly if it helped him to shed new light on Charlie Brown’s character. For this special, he conceived of a story that would see Charlie Brown compete in a whole new arena, with a whole new way to come out on the bottom of things. 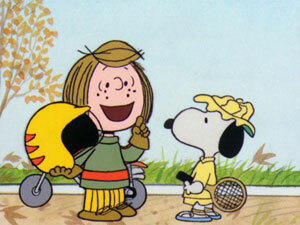 Nevertheless, Charlie Brown’s legendary spirit for the sporting life sees him compete in the big race, facing off against (among others) Patty and The Masked Marvel— Snoopy in a rather transparent disguise. The ensuing race finds Charlie and Snoopy end up in the wrong hospitals, a tennis ball launcher substituting for a dirt bike, a pumpkin helmet (with a Great Pumpkin gag or two, of course), and Snoopy playing hare to Charlie’s tortoise. It’s all charming enough, but a little lightweight… until the ending, which is guaranteed to make you smile, recognizing that the finish makes this special into a classic. 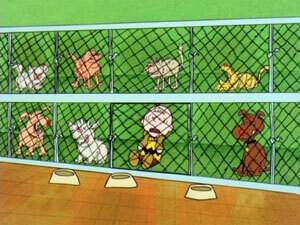 In the world of Peanuts, there is one constant: Charlie Brown always loses, unless he wins, but even then he still loses. And as frustrating as that can be, we wouldn’t have it any other way. Emmy voters agreed, as this special won producers Lee Mendelson and Bill Melendez an Emmy Award for Outstanding Children’s Special. 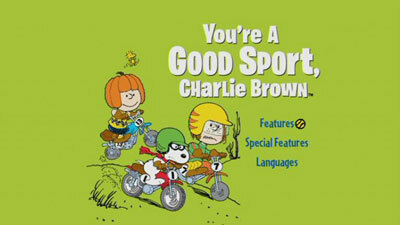 You’re The Greatest, Charlie Brown is this disc’s bonus special, from 1979, and it’s just about as good as the spotlighted one. 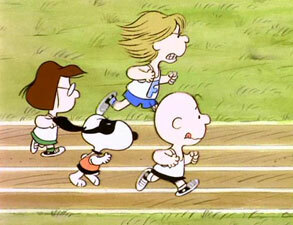 Charlie Brown is asked by the gang to be their representative at the Junior Olympics. After beginning training under Peppermint Patty, his friends show their confidence in him by asking Marcy to also compete for their school. 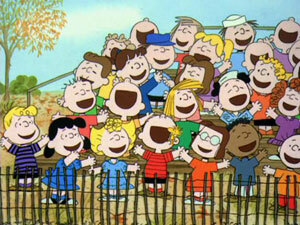 (Yes, in this special, Peppermint Patty and Marcy are both classmates of Charlie Brown, rather than living in a different neighborhood. Hey, Schulz wrote it, and they’re his characters, so who can argue?) The Masked Marvel appears again, and though the ending is not quite as classic, it’s still a strong, entertaining special. Phil Roman directs again, but no Guaraldi music this time. 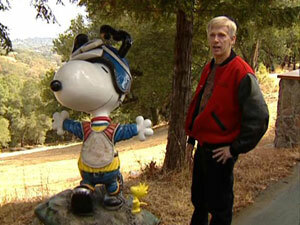 Dust Yourself Off & Pick Yourself Up, Charlie Brown (11:35) is the sole featurette on the disc. 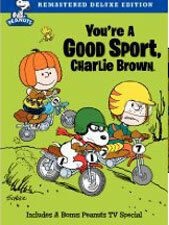 It examines the role of sports in the Peanuts comic strip, and nicely showcases Craig Schulz and his love of motocross. The best thing in the featurette (sorry, Jerry Beck and Shari Young Kuchenbecker, PhD, author of Raising Winners) is the home video footage of a young Craig tearing around his dad’s private golf course on his dirt bike! The disc also has two trailers for Peanuts DVDs, plus additional trailers for Tom And Jerry Tales: Volume 6, and Scooby-Doo, Where Are You? : Volume 1. Standard keepcase, no insert. The initial release of this title has a foil slipcover identical to the case cover. I’m not always sure about the bold background colors on these Warner Peanuts releases, but that green really works for me. The video quality is fairly consistent with the other Peanuts discs, and appropriate for the age of the shows on display. The images are vaguely soft, and there are copious examples of dirt and smudges that betray this special as a product of the analog age. But the compression work is just fine, and the colors pleasing. Incidentally, the bonus special included on this disc appears less “remastered,” with colors that are more washed out and tend towards pink at times. The Vince Guaraldi music for this special branches into different territory, but still remains perfect for the Peanuts crew. While the music and voices are not as crisp sounding as they would be on a special recorded today, the mono sound is quite satisfactory. Personally, I’m glad we’ve gotten all the big holiday specials out of the way. They’re great and all, but it’s nice to see more of the non-holiday ones emerging. At a decent price point, picking up this series is relatively affordable and certainly rewarding. However, I’m still waiting to hear more of Warner’s plans for larger sets, which would undoubtedly be an even better value for fans.